The old mantra of 'if you're good enough, you're old enough' could well be tested in the forthcoming Six Nations after 18-year-olds Harry Robinson and Angelo Esposito were named in the Wales and Italy squads respectively. If the pair get the nod then they will follow in the footsteps of some other teenagers who have made their international debuts in the northern hemisphere's premier tournament. ESPNscrum trawls the Statsguru archives to see which nations are not afraid of giving youth its head in the Six Nations and singles out some key protagonists. Playing for your country in the Championship whilst in your teens is clearly nothing new. Since the tournament started in its old Home Nations guise back in 1883, 209 youngsters have been handed the chance to stake a claim. And it is Scotland who have adopted the most consistent youth policy with 62 players under the age of 20 handed their debuts in the competition. The last of those Test rugby rookies went on to achieve huge things for his country. Future British & Irish Lions fly-half Gregor Townsend took his bow in the Championship in 1993 at the age of 19 - the first teenager since to do so for Scotland since Jim Renwick who was 19 when he turned out against France in 1972. This perceived policy is still evident today with current boss Andy Robinson opting to inject some youth into his recent squad selection in the form of Glasgow's 19-year-old Stuart Hogg. Wales were widely lauded for their exciting youngsters in the recent World Cup but that is nothing new as far as their coach Warren Gatland is concerned. He has chosen to blood two young flyers in the Six Nations with George North handed the chance to impress against France in 2011 and Tom Prydie against Italy in 2010. The duo have experienced mixed fortunes since their headline-grabbing introductions with North establishing himself as one of the standout players in the recent World Cup while Prydie missed out on selection and finds himself back in the U20s for 2012. But this daring selection policy extends well beyond Gatland's tenure. Legendary duo Gareth Edwards and JPR Williams both made their debuts in their teens in the 1967 and 1969 Five Nations respectively and went on to secure a spot in Welsh rugby folklore. If Harry Robinson gets selected in this year's tournament he will be under pressure to grab his chance with both hands as only three of the 51 young guns thrown into the thick of the Championship have been 'one cap wonders'. Bill Everson (1926), Bill Roberts (1929) and Dave Thomas (1961) were all handed their debuts prior to their 20th birthday but failed to pull on the famous red jersey again. On the subject of torrid teenage debuts, another immediately springs to mind with a certain fresh-faced Englishman enduring a baptism of fire in Cardiff back in 2005. A sprightly Mathew Tait was famously thumped into the Millennium Stadium turf by Wales' Gavin Henson with the image intrinsically linked with the hosts' eventual Grand Slam triumph. Tait was at the Newcastle Falcons at the time of his debut and drew many comparisons with another teenage debutant to have emerged from Kingston Park. Legendary fly-half Jonny Wilkinson announced himself on the international scene - in the unfamiliar position of winger - back in 1998 against Ireland in the then Five Nations. Another notable figure, Steve Hanley, earned a cap during the same Five Nations at the age of 19 but it was a bittersweet game for him. 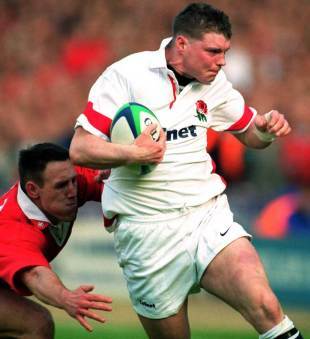 While the Premiership's record try-scorer crossed the line for England against Wales, in what turned out to be a famous loss, he also sustained a broken arm, thanks to Craig Quinnell, and never played for the red rose side again. England's record of having blooded just one novice during the Six Nations is matched by Italy as they handed Mirco Bergamasco a cap back in 2002 in their 33-12 loss to France. Throughout their Test history, they have handed debuts to just 30 adolescenti - a similar total to France - the tournament's most successful side - who have given 34 youngsters a chance to shine in their entire Test history. But despite Les Bleus' historical tendency to back experience over youth, they do set the bar in the Six Nations with three. Morgan Parra, Yann David and Frederic Michalak all made their debuts as teenagers. Parra has gone on to shine as one of the world's premier half-backs while the mercurial Michalak is one of the few Europeans to have played in both the Heineken Cup and Super Rugby. And it is worth noting that back in 2001 when Michalak played in the Six Nations for the first time, they took the Grand Slam. This time around, Philippe Saint-Andre has put his faith in the tried and tested with David - currently on just four caps - the youngest player in the 30-man training squad at the age of 23. Ireland have adopted a similar approach in recent year. Despite having fielded 44 teenagers in the tournament since 1883, the most recent was Alastair McKibbon back in 1977. Current coach Declan Kidney has shown no signs of reversing this trend for the 2012 competition after naming a squad heavily weighted with players on the wrong side of 30. So what can be learned ahead of the 2012 Six Nations? There are evidently reservations about gambling with a youthful selection during the battle for northern hemisphere supremacy but at the same time greatness awaits those who make the most of that opportunity. However, for every North there is also an Everson, Roberts or Thomas.